To respond to the increasing demand for recreation programs on campus, the expanded Recreation Center at the California Polytechnic State University at San Luis Obispo was designed to provide a social gathering place for students, faculty, and alumni. The project, which students approved in a 2008 referendum, was initiated due to a lack of available space and services in the original Recreation Center. The new 165,700 sq. 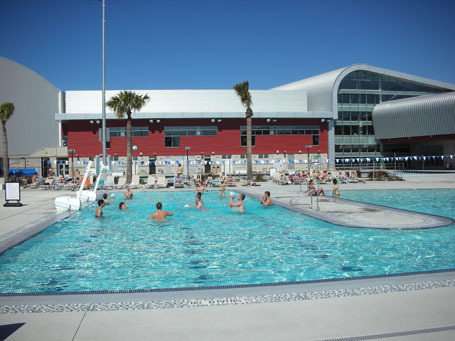 ft. recreation center is the largest university recreation center on the West Coast. The expansion also includes one spin studio, as well as two multi-purpose studios. There is also a Multi Activity Center (MAC) that has capacity to seat 730 people and will be used for small events such as movie screenings and concerts. The outside of the center contains beach volleyball courts, a recreation pool and areas to barbecue, complimenting the existing 50-meter pool. California Polytechnic State University achieved the U.S. Green Building Council’s Leadership in Energy and Environmental Design (LEED) Gold certification for energy efficient design.